Interactive kiosks are not new but the technology that powers them is constantly evolving making them more powerful and personalised as the years go by. Did you know that the first self-service, interactive kiosk was developed in 1977 at the University of Illinois at Urbana–Champaign? You might also be interested in learning that the first successful network of interactive kiosks used for commercial purposes was a project developed in 1985. That’s some time ago! 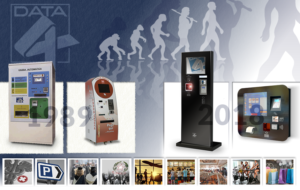 At Data4 we launched our first interactive kiosk for the exchange of money in the banking sector back in 1989. 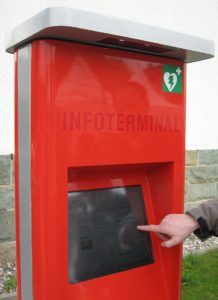 Since that first kiosk three decades ago and through the years, our company quickly became the leading Italian provider of kiosks dedicated to the payment of medical services for public and private hospitals. Today, our hardware and software technology, designed in Italy, can be found in many different segments of the self-service kiosk marketplace. Nowadays self-service kiosks can be found almost everywhere across the globe: in airports, stores, fast food restaurants, cinemas, at exhibitions and in public administrations. It’s hard not to miss them! Consumers are quickly becoming accustomed to such technology and experience first-hand the time-saving benefits it brings. Moreover, service providers are seeing a return on investment in such technology as it allows them to streamline the customer experience, improve crowd management and increase sales. A win-win situation for all that will bring even better value for both parties in the next five to ten years as technological developments progress at an even quicker pace and on a global scale. You may be aware that Data4 is a member of RCH Group which was founded in 1969. In 2019 our group will celebrate the fact that we are half a century old! The RCH Group has grown into a global organization, comprising of several companies with a presence in 40 countries worldwide. It is renowned for its successful combination of advanced product engineering with distinctive design. Headquartered in Northern Italy, RCH Group has operational offices in Austria, Vietnam, China, and Asia, as well as a vast network of partner resellers. Data4 designs and manufactures innovative self-service and automatic systems for the payment of goods and services in cash or electronically. Based on open standards, the company’s technology can be seamlessly integrated with third party applications, allowing customers to retain their own payment collection and receipt issuing software. Data4 fully leverages the longstanding experience and expertise of RCH Group, allowing the company to provide a complete hardware and software solution for the retail and Horeca sectors. Today’s modern stores and restaurants are increasingly introducing kiosks and the possibility of rapid self-service orders to their clientele. The sales management tools that our group offers provides merchants with the opportunity to follow, manage and monetise the entire customer journey from POS, kiosks, printers to software integrations. In late September we travelled to London to showcase our fully integrated and automatic self-service systems at Kiosk Summit 2018. This is the second year that Data4 attended this event which is Europe’s only dedicated event for organisations and individuals, who utilise self-service technology to interact with their clients, streamline their customer journey and gain increased efficiency by using cutting-edge interactivity. Kiosk Summit proved once again to be a great show for our company as it allowed us to meet our customers face-to-face and find out more about their requirements, as well as learn more about the latest trends in the interactive kiosk marketplace. In fact, our experience at the show was a very positive one for our company, proving once again that our continued investment in client relationships, market research and R&D allows us to deliver what the market needs. We’re already looking forward to Kiosk Summit 2019! PreviousPrevious post:A pioneering scientist explains ‘deep learning’NextNext post:AI AI AI, what role might AI play in PR in the future?